We design and build custom websites. During the design process, our number one goal when servicing our clients is to listen, and then listen some more. We understand that each one of our clients is unique and that each web site has a different purpose. We work closely with our clients to make sure that the exact look, feel, and meaning is conveyed. As a rule, we strive to work quickly, cost-effectively and on a schedule. We pride ourselves in meeting deadlines. We love it when our clients say, "slow down, we can't keep up with your pace," because that means we're saving our clients time & money. So whether you're looking to create a brand new site or upgrade your existing one, we are here to make it happen. 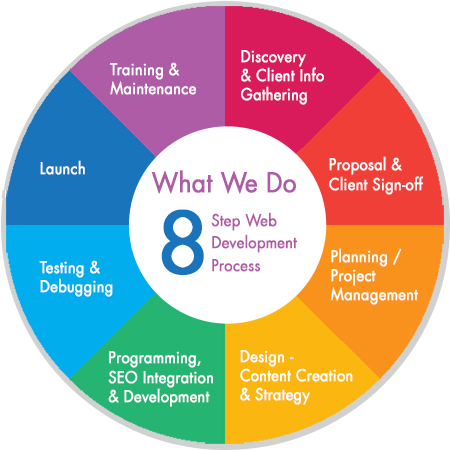 AMB Solutions is a full-service San Diego area Web Design Company. Creating cutting-edge graphic design and programming code is our primary business. It's our goal to provide an optimal website user experience, while also making your site visibile in the marketplace. Today a bulk of our business today focuses around creating and converting websites to high quality "responsive" websites. In many business fields nearly 50% of views are from a phone or tablet. We can help you create a site to engage and reach these customers. We set up your website so that if you choose, you can managed it by yourself. By integrating a Content Mangement System like WordPress, the user is able, even with limited expertise, to add, modify, and remove content from a website without the help of a webmaster. We specialize in writing Topic Clusters. And helping your website Builds Authority. What are Topic Clusters? They're multiple content pieces surrounding one PILLAR topic. Search Engines like Google and Bing love them! They let search engines know that you are an authoritative and a trustworthy site on a specific topic. We focus on creating content one topic at a time and internal linking, instead of creating random pieces of content around "keywords". Keywords are great but Topic Clusters are the bomb in SEO! After we build your website, we give you the option to either maintain & update your own website or have us help you do it. Most of our clients are small to medium size businesses and what we've learned is that many small businesses often just want to put up a simple site and call it a day. We're good with that! If / when our client needs support - we support them. And instead of mandating a monthly maintenance contract/fee, we simply invoice our clients when a maintenance request is made. For clients that want to manage their own website, we offer basic training on the primary functions of their website. We can also create a customizable User Manuals that correspond directly with your unique website. We predominately do this for WordPress websites. We can also engage in transactional emails, which are are automated emails that are sent to your customers/donors inboxes after they have taken a certain action on your website or have responded to an email. Transacational (follow-up) email can be launched after your customer/donor fills out a form, purchases a product, or needs updating on the progress of their order. Often, these are automatic plain text emails that you can set in advance..
Amazon is a search engine, just like Google, but the difference between Amazon's (A9 - ranking algorithm search) and Google's search is that Amazon is a buying platform. Amazon cares about their buyers and selling stuff to those buyers, because when Amazon sells products on their platform they make money - tons of money! We assist you in making sure that your product photographs are cropped, whitened and in optimal shape for Amazon. We help you research your competitor's listing and establish the correct and/or competitive pricing. If you are a manufacturer and/or are selling a private label product, it is imparative that you obtain legitimate product reviews on your items as soon as possible. From the start, you need to have a mimimum of 5-10 product reviews per product. Positive reviews help to reduce a customer’s hesitancy when purchasing a product. Products that have 4 and 5 star ratings are purchased more frequently than products with 1 to 3 star ratings. Additionally, customer often like to read what others have written about your product. Listings with product reviews are much more likely to get better search results on Amazon than products with no sales history. Important note: There are sites on the web that offer illegitimate Amazon product reviews from reviewer that have never see nor touched a product, and they write "blind" product reviews in exchange for companies paying them cash. Amazon seriously frowns on this practice and has become increasing stricter on such reviews. “Verified purchase” reviews are now much more valuable than reviews that haven’t come from “verified” purchases, raising the importance of not only getting product reviews on new listings. Being honest is imperative and you should always aim to get “verified” product reviews. Amazon looks positively on companies that respond to buyers that give you a product rating. No matter what rating you product obtains from a client, you should always respond to them by thanking them for their review. If the review is not steller, this is a place where you can always ask them how you can improve on yoru product! If you are building a private label business on Amazon, you’re going to need UPCs (Universal Product Codes) for each product you list. We can help you set up your GS1 account to get this going. Additionally, you should not be buying UPCs to put onto other companies’ existing products. You have to match your offer (if it's an affilitae) to the existing listings in the Amazon catalog. Based on what you've read above, are you ready to take the next step to learn more about AMB Solutions or to get started? If so, we'd love to hear from you. To start working with AMB Solutions, call: 858-663-2956 or visit on our contact page!